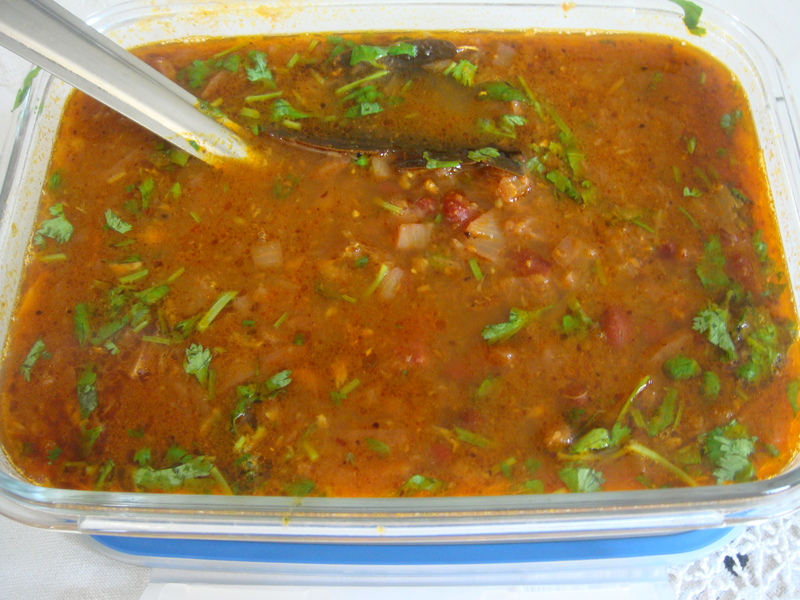 It is a high protein, nutritious Rajma/red kidney beans preparation. Tastes very good with boiled / steamed rice. On a full flame place the pressure cooker on the stove with Rajma/red kidney beans and three glasses of water, chopped onions and salt. The moment pressure is formed, reduce to low flame, cook for twenty five minutes. Switch off the stove, let the pressure cooker cool to room temperature. Open the lid and check, Rajma/red kidney beans will be totally cooked and soft. Heat oil in a deep pan and put cumin seeds, when it starts to crackle,add bay leaves, powdered cloves,cinnamon and black cardamom seeds, saute for a few seconds, add coriander powder, red chilli powder and turmeric powder. Add crushed garlic cloves, grated ginger, tomato puree and saute for a few minutes more. Keep stirring on slow flame and continue to cook till the oil surfaces on the masala. Add cooked Rajma/red kidney beans to the masala and mix. Adjust salt and add garam masala powder. Lower the heat and simmer for about fifteen to twenty minutes on low heat. Garnish with finely chopped coriander leaves.Serve hot with boiled/ steamed rice, pulaos ,biryanis or with any Indian bread of your choice. Kidney beans, also known as rajma, is a well known pulse that is extensively used all over the world in the preparation of variety of dishes, particularly in rice, curries, salads and toppings. Mexican foods that are popular all over the Globe. And kidney beans is the main component that is used in preparing the dishes. Tacos, Mexican chaat and Mexican Bean Hotpot are few famous dishes that are prepared using kidney beans or rajma. However, many people dread eating kidney beans as it is considered to be fattening or is gassy. However, there are many health benefits of kidney beans that we need to know. The health benefits of kidney beans are not just for a part of the body but improves the overall health of our body. The benefits of kidney beans definitely makes us include this pulse in our daily diet. Provides Energy: Rajma/red kidney beans boosts our energy as it is high in iron content. It contains high amount of iron which is the main source that is required for increasing body metabolism and energy. It also helps in the circulation of oxygen throughout the body. Calorie count: The amount of calorie found in Rajma/red kidney beans is moderate and can be eaten by all the age group. Adding kidney beans to a salad or low calorie soup during lunch will be a good choice. At the same time, for those who want to maintain a consistent weight can have rajma or kidney beans. Maintains Blood Sugar: Rajma is a well known fiber rich pulse. These fibers in rajma decreases the metabolism rate of the carbohydrate content in the beans. Good For Brain: This pulse offers outstanding benefits for brain. It contains high amount of vitamin K which provides essential nutrition for both brain and nervous system. Kidney beans are also a good source of vitamin B, which is essential for brain cells. It nourishes the brain nerves and cells which prevents age related disease like Alzheimer’s. Improves bowel movements: The fiber present in kidney beans helps in maintaining healthy bowel movements. If it is eaten in the right quantity, it helps in cleansing the digestive tract. Regular bowel movements are associated with a lower risk of colon cancer. Cardiovascular Benefits: High magnesium content and fiber in kidney beans is responsible for lowering bad cholesterol levels. High magnesium level found in kidney beans helps the body fight diseases associated with the risk of stroke, heart attack, and peripheral vascular disease. It also helps in having a healthy cardiovascular system. These are some of the major health benefits of kidney beans. Add them in your daily diet as it keeps you healthy in the long run.